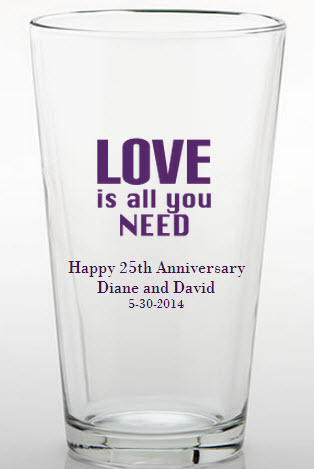 We found the right way to make a toast to the special couple and our wedding anniversary favors are so popular! 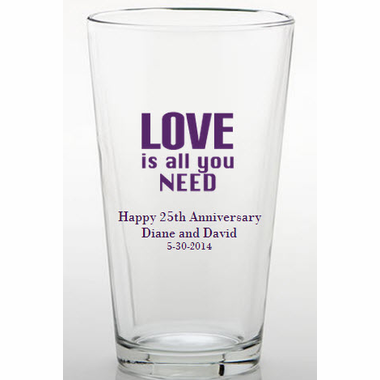 With these personalized glasses, you can fill them with a cool beverage or cold beer and let the festivities commence - love is all you need! Each is 16 ounce glass is 6 inches tall and 3.5 inches in diameter with the classic tapered pint glass shape and is made in the USA of quality domestic glass. Sold and packaged in bulk, these pint glasses are sure be a hit at your party!